Scarborough Players Present "Noises Off"
Scarborough Players is proud to be celebrating its 60th anniversary with the 2018-2019 season! To honour this achievement, Scarborough Players will be engaging the community on social media to share their special memories of past productions as well as celebrating during the first show of the 60th season! 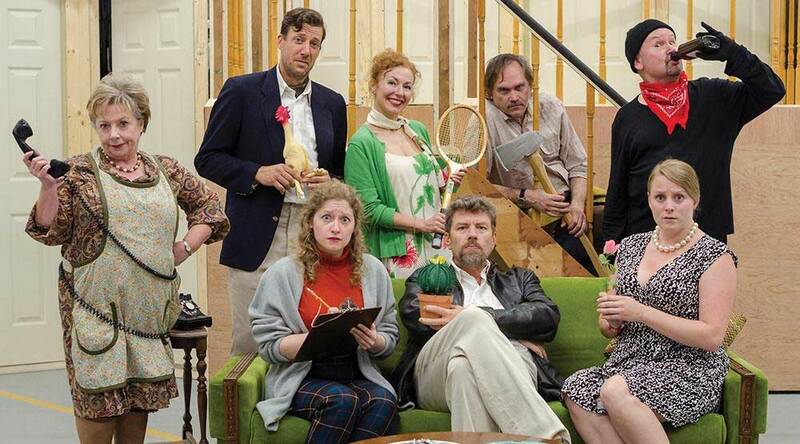 Join us for the hilarious production of Noises Off directed by the award-winning Director, Harvey Levkoe. Called “the funniest farce ever written”, they invite you behind the scenes to witness the foibles and follies of this play within a play as a cast rehearses and performs a flop called “Nothin’s On”. This look at the inner workings of theatre – missed cues, flubbed lines, secret affairs and doors that won’t open – will have you rolling in the aisles. Join us for this award-winning play to see slapstick, slamming doors, falling trousers and the unforgettable flying sardines. Scarborough Players is pleased to announce the launch of a new hearing loop system at the theatre located at 3600 Kingston Road. This system installation has been made possible with the support of the Trillium Foundation. This will be the only theatre in Toronto with this type of hearing system. It is a special type of sound system for use by people with hearing aids and more information will be available shortly. The new hearing system will be officially launched during the opening of Noises Off. This is Scarborough Players first comedy of their 60th season. It opens on October 5, 2018 and runs to October 20, 2018. Our very popular Audience Talk-Back will be held after the Thursday, October 18th performance. After the play, we invite you to remain seated as the cast and crew return to the stage in an informal Question and Answer session. Would you like to learn what happens “behind the scenes?” Here is your chance! Get involved by following the group’s adventures on Facebook, Twitter and Instagram. Share your memories, photos and anecdotes of Scarborough Players’ productions for their 60th anniversary at scarboroughplayers60th@gmail.com. SHOW DATES: October 5*, 6, 11, 12, 13, 18 and 19 at 8:00pm. October 7, 14 and 20 at 2:00pm. TICKETS: Regular price $24 / Seniors & Students $19.